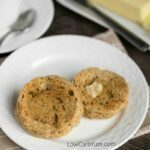 Low carb and gluten free almond meal pancakes are easy to make using almond flour. 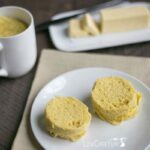 This basic recipe is very popular. 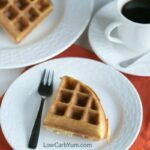 Perfect with sugar free syrup! I enjoy treating myself to pancakes over the weekend. 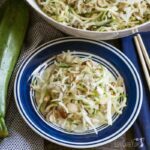 Thankfully, there are some terrific low carb options so we aren’t stuck eating just eggs and bacon. 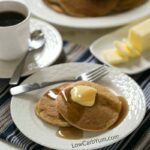 This is Laura’s recipe from About.com for low carb almond meal pancakes. She suggests adjusting the amount of liquid to get the thickness desired, just like regular pancakes. It makes a difference in what type of almond flour is used. Some have a coarser grind. The finer ground almonds are best. Sparkling water should make puffier pancakes. 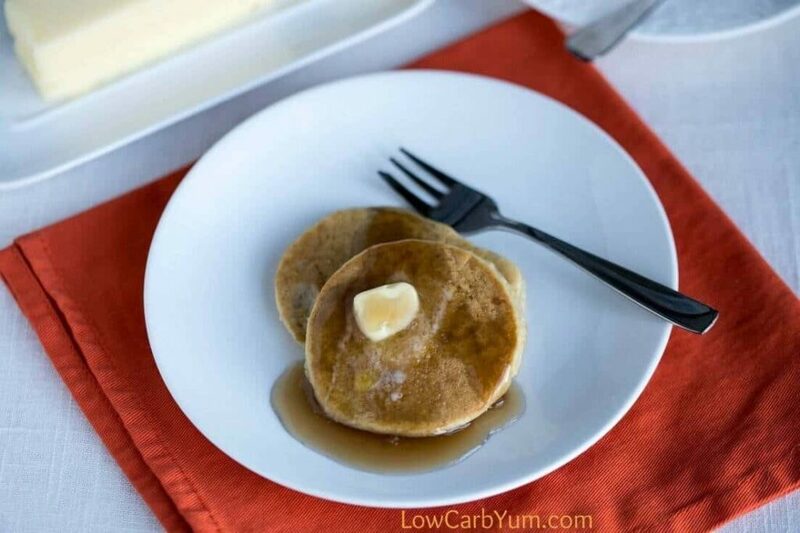 These low carb and gluten free pancakes are perfect topped with sugar free maple syrup or homemade low carb blueberry sauce. 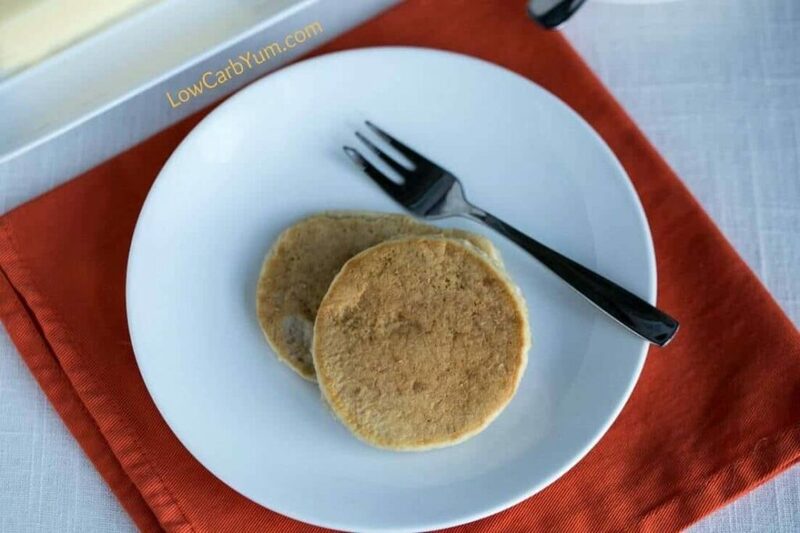 These low carb gluten free almond meal pancakes cook up best on a lower heat setting. I set my electric grill to around 325-350°F. You want to make sure the inside gets cooked without the outside burning. When I have more time on the weekends, I’ll cook up a large batch of pancakes. This makes enough to last a week. They also freeze well if you want to keep them longer. 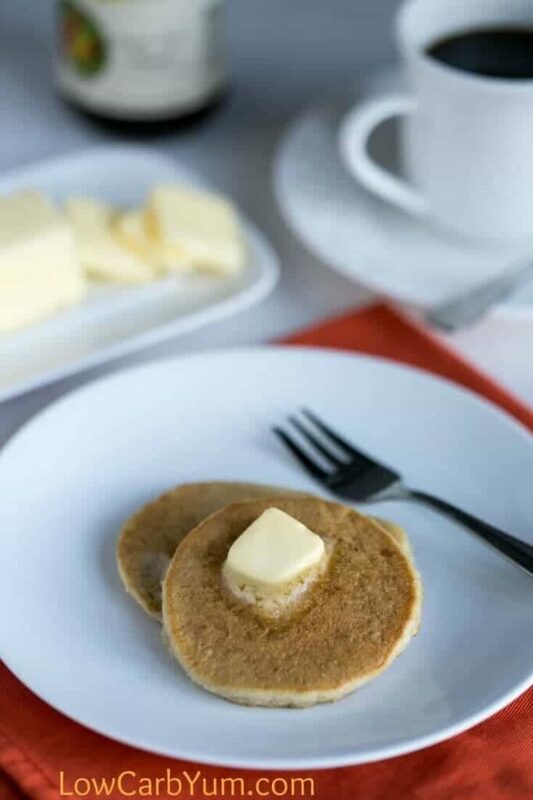 My husband has no idea that these are low carb pancakes. 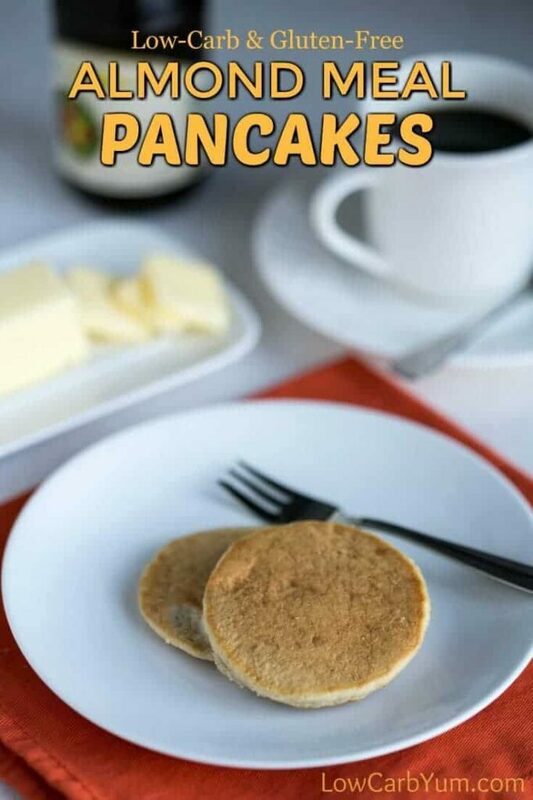 He loads them up with butter and regular syrup without complaining. Maybe I can sneak some sugar free syrup in his bottle without him noticing. I’m still working on getting my husband to cut back on his carbs. He drinks a lot of regular soda. I’d be happy if he would just drop that from his diet. Sometimes when I’m hungry after work, I’ll grab a single pancake to tie me over until dinner. 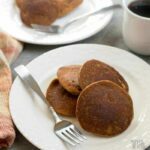 The almond meal makes these pancakes very filling. Almonds are a bit more expensive that wheat. But, you’ll save in the long run with the health benefits you get by going grain free. If have a nut allergy or can’t eat almonds, you can make a low carb flour out of sunflower seeds instead. And, there’s always the option of using coconut flour. I’ll be experimenting with more pancake recipes in the future. One of the things on my list to try is oat flour. It’s still a grain so it’s not a good option for those who have gone grain-free. UPDATE: You can find my improved almond meal pancake recipe here. 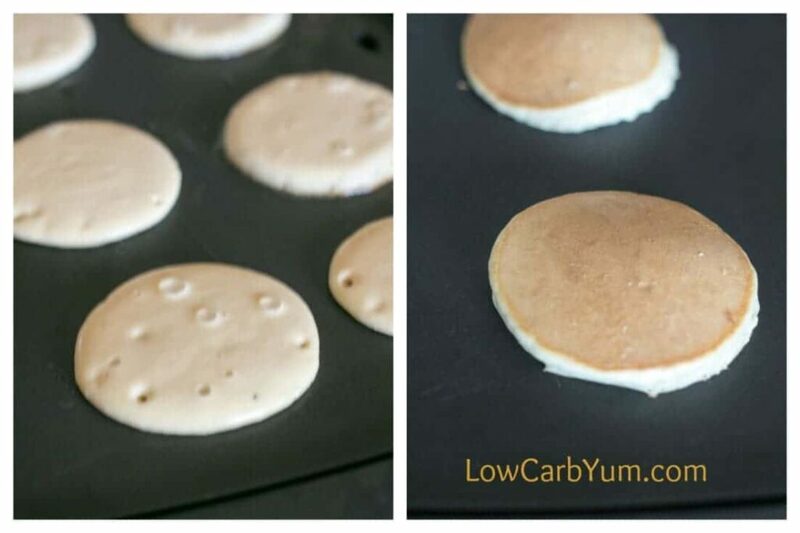 Low carb and gluten free pancakes are easy to make using almond flour. 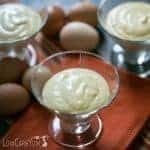 This basic recipe is very popular. Pour about 2-3 tablespoons batter for each pancake in hot skillet or grill. Flip them when the edges are dry and underside is brown. An improved almond flour pancake recipe is available here. 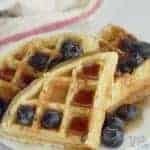 I just made these this morning and they were the bomb! Easy to make and flip in the pan. Thank you for the recipe. First, I would like to say that these pancakes are delicious. However, the nutritional information is a little misleading. 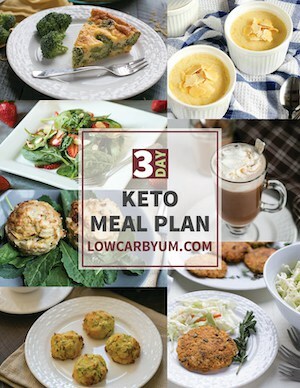 Following exact directions this recipe makes 3 servings. Which is 2 pancakes measured in 1/4 cup. 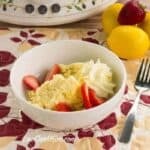 Calories are 367 and about 6 net carbs per serving. I don’t want to sound like I’m complaining, I would just hate for someone to follow this recipe and over do their carb intake unknowingly. I can fix that as I rarely use 1/4 cup measure. It’s more like a tablespoon or two for small silver dollar size. At the beginning these are referred to as Almond MEAL pancakes, but the recipe calls for Almond FLOUR. Aren’t they two totally different things? I am new to this type of cooking/baking. Almond meal can be blanched or unblanched though usually still with skins. Basically, they are both just ground almonds. I make these pancakes every Saturday morning for my husband and I. 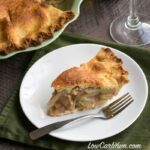 Thank you so much for a beautiful recipe! I’m happy you both are enjoying the recipe! 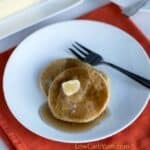 I’m always on the lookout for new breakfast ideas, these pancakes sound great can’t wait to try them! These were delicious. I did a variation where I used almond meal instead, added GF vanilla protein powder and some vanilla extract to the mix. They came out great! The numbers don’t add up. I made the whole batch, at 1/4 cup each pancake it comes up to a total of 6. Serving size says 3 pancakes, serve 4 people; really? How? With 6 pancakes? Nutrition facts are wrong too, it’s 9 carbs per serving not 3 like you said. The taste was great! Loved them. But can’t eat 3 at 9 carbs…. They are silver dollar size (maybe 3 inches in diameter). I limit myself to 3 pancakes and typically make 10-12. Thank you so very much for all your hard work !! I really enjoy your recipes, thanks again. 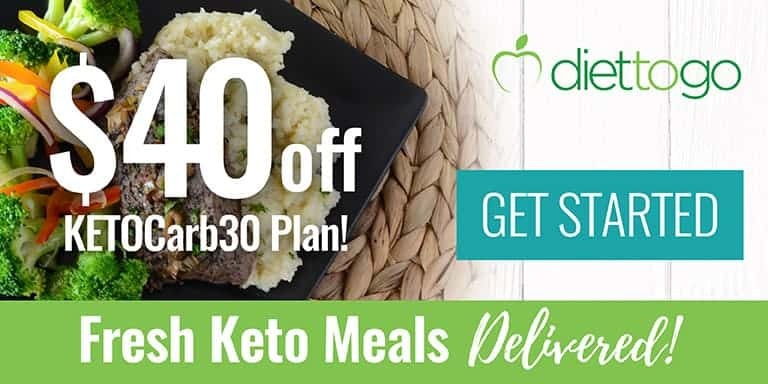 I’m looking for healthy eating recipes low carbs. I just found out I’m diabetic. I want recipes that taste good. Yours look good. You should have no trouble finding a few you like here Nina! I’m actually putting together some of that information in an eBook that I will offer free on the blog. I may also put a few pages together in a resources section. It’s been on my “to do” list forever!